So t' hell with yer now lad and be on yer way. It's said that history is written by the winning side, and you'll certainly find evidence of this in the post-Thatcher attitude to trade unions and strike action. You only need a quick look at the posted reactions on the BBC web site to their coverage the recent postal strikes to get a flavour of this, a mishmash of misinformed opinion, draconian tub-thumping ("Sack them all!") and angry condemnation of the very idea that public sector workers should be allowed to take industrial action, whatever the reason. Unions, one semi-literate commentator even claimed, are a thing of the past, while others were quick to tar all union leaders as self-serving and draw parallels with the miner's strike of the 1980s. And look what happened to them. For someone who has been a workplace union representative for sixteen years and who can quote you any number of occasions when union assistance and intervention has helped prevent abuse of working rights, and who has personal experience of how readily those rights are sometimes violated in corporations where the union presence is either weak or non-existent (oh the stories I could tell you about one of our biggest supermarket chains), this makes for depressing reading. Such vitriol signifies not just the triumph of the self-serving individual over the communal voice, but also the power of tabloid newspapers to shape both the news itself and the opinions of those who all too willingly ingest their version of it. This was certainly the case with the 1984-85 miners' strike, a sometimes bitter and year-long dispute triggered by the National Coal Board's declared intention to close twenty working pits with the loss of twenty thousand jobs. For those not involved in the strike, information about it in these pre-internet times was available only through the national media, and therein lay the problem. With a few notable exceptions, the press coverage was biased against the miners to a sometimes shocking degree (if you're looking for a modern equivalent, then check out the tabloid handling of just about any story involving asylum seekers), fabricating stories and highlighting and distorting any trace of striker aggression, but refusing to even cover the multiple acts of police violence that were committed against the miners. National Union of Mineworkers leader Arthur Scargill became a particular target of hostile and fraudulent reporting, which reached a peak on 15th May 1984, when a picture of Scargill, his arm raised in a wave to one of the miners, was to be plastered on the front page of The Sun accompanied by the headline 'Mine Führer'. In an act of solidarity with the miners, and outraged at this blatant deception, print workers refused to set the page, which targeted them for future dismissal by Sun overlord and Australian oligarch, Rupert Murdoch. The Miners' Campaign Tapes is a collection of independently produced video shorts that were designed as a direct response to this blanket of misinformation. If you're looking for a balanced view of the dispute here then you're out of luck – the films are unashamedly partisan and with very good reason, an agitprop slingshot in the battle against a news media Goliath. With no national distribution or network TV screenings at their disposal, the tapes were made freely available to any sympathetic individual or group who could arrange a screening and help score just a few retaliatory points in the propaganda war. 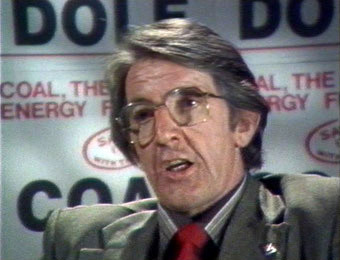 Despite titles that suggest angry polemics and the inclusion of extracts from Arthur Scargill's impassioned speeches, the tone of the films is more considered than you might expect, with the miners themselves arguing their case in calm and convincing manner and Labour MP Dennis Skinner providing the facts and figures of the dispute. Technically the tapes also have historical value, being shot and edited on the once popular U-Matic video system and boasting basic, first generation DVE titles. The use of then popular music tracks, including Heaven 17's Crushed by the Wheels of Industry, Joe Jackson's Sunday Papers and Working with Fire and Steel by China Crisis, is also effective – the news that the BFI were unable to obtain clearance for the Clash's Police and Thieves for this release is a surprise, though I can't help but suspect this is more down to record label CBS than the band themselves. Of interest is that both Ken Loach and Julie Christie are thanked on the end credits of several of the films. This BFI disc features six short films from a ten-film set, which itself was part of a project that gave birth to fifty such productions. 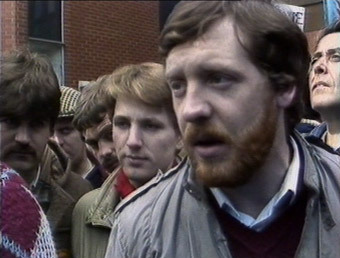 Given the dim view of the strike still held and encouraged by those in positions of power, the tapes themselves are a valuable document of an alternative viewpoint to the one that most commonly finds its way into print, recording as it does the faces, voices and experiences of those who stood on the picket lines and who witnessed the incidents that TV and newspapers chose to ignore. They also provide a timely reminder that there are two sides to every story, and that we really, really shouldn't believe everything we read. Not Just Tea and Sandwiches (11:48) examines the role played in the strike by the miners' wives, whom the tabloids falsely painted as being vocally opposed to their action. Their determination and resolve can't help but recall the solidarity of the miners' wives of Harlan County U.S.A. during another hard fought dispute between mine workers and their bosses. Solidarity (12:40) looks at wider trade union support for the miners and the links with other unions at a time when attempts to crush any secondary action were already under way. Some spirited shots are taken at the CBI and those providing Conservative party funding, and a flavour of how the strike was sustained through the support of others is nicely captured. Straight Speaking (10:28) has Dennis Skinner providing the facts and history behind the strike and responding directly to some of the statements made about the miners and their action by Ian MacGregor. The video editors have a field day with the stern faces of Tory ministers. The Lie Machine (15:50) is an excellent and detailed assault on press coverage of the strike, nicely presented to camera by Gavin Richards of the Campaign Tape Project in the manner of What the Papers Say, a quick-fire round-up of the week's press coverage that has since vanished from our screens. Left-wing journalist Paul Foot contributes some useful analysis, but as ever the best material comes from the miners themselves, who damningly compare their picket line experiences to how they were reported by the media. The manner in which BBC footage is edited is called into question, particularly in what is omitted (several hours of strikers chatting amiably with the police gets no coverage, but when a brief skirmish develops it is headlined), though for blatant false reporting, The Sun is singled out as the worst offender. Oh how times change. Only Doing Their Job? 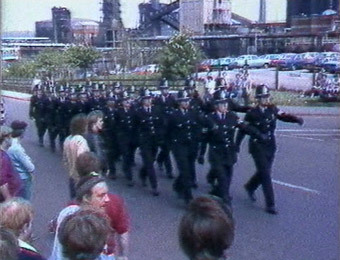 (25:20) looks at the police handling of the miners' strike and makes for compelling and informative viewing. You might not immediately warm to Doncaster NUM official Dave Douglass's ideological talk of class war (though he does make some very valid points), but the bulk of the programme is wisely spent in the company of a group of Doncaster miners, whose pub chat recollections of their experiences on the picket lines – including beatings taken from the police and the effect this has had on community relations – have an earthy honesty that is more persuasive than any pre-prepared speech. There are doubtless those who will still dismiss their claims and the very idea that a British police force would ever behave in this manner without extreme provocation, but having once watched a former girlfriend grabbed by a mounted policeman and thrown into razor wire for the heinous crime of tying a peace ribbon to the perimeter fence at Greenham Common, I beg to differ. The tapes were shot on a mixture of high-band and low-band U-Matic video tape and edited using the traditional linear copy-to-tape method, which results in a slight drop in quality from the shot material. The results are comparable to first generation VHS, a little fuzzy on fine detail, with slightly muted colours and a fair few of those tape blips that old-school video seemed to pick up no matter how you stored it. The incorporation of material from a variety of other sources does mean that the picture quality can vary from shot to shot, but this is very much part of the video documentary aesthetic of the period and not in any way an issue. The basic nature of the graphics and the edge shadows that cling to the letters prompted a small twinge of nostalgia. Almost inevitably there's some tape hiss to contend with on the mono 2.0 soundtrack and the dynamic range is a little restricted, but the recorded dialogue is always clear and the music well mixed. There are none on the disc itself, but once again the BFI have provided a fine Booklet to accompany the DVD, this one containing a detailed article on independent filmmaking and the Miners' Campaign Tapes by Julian Petley, an excellent insider's view of making the Tapes by Chris Reeves, and an inspiring piece by David Peace on how the research for his book GB84 opened his eyes to the struggle of his fellow Yorkshiremen. In my workplace there's been a recent trend for putting up posters stating the bleeding obvious, in what those who initiated the project believe are providing inspirational messages on matters of equality and diversity. One of them states "If you disagree with me, tell me why," under which I've been repeatedly tempted to write, "What's the point? You wouldn't listen." It's that closed attitude to alternative viewpoints, one I seem to encounter on a daily basis, that makes it probable that a good many potential viewers would simply dismiss the contents of this disc as lefty propaganda and refuse to watch a single frame. But for those of you who question what you read in the newspapers and see on TV and the often biased manner in which stories are reported, shaped and even fabricated – and every one of you should – The Miners' Campaign Tapes provides a rare alternative viewpoint to the one that was presented by the mainstream media of the period and is sustained by the tabloid press of today. The tapes are valuable documents in themselves and would be an excellent kicking off point for debate on a range of social, historical and political issues, and as such have considerable educational value as well. On that basis the disc comes warmly recommended.